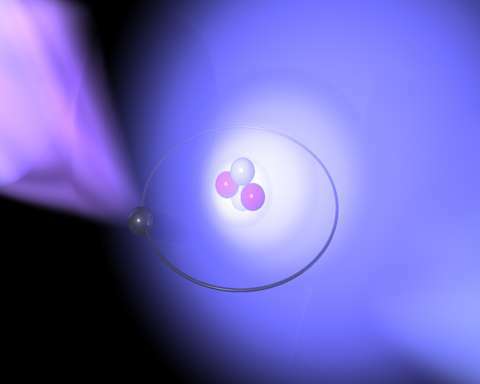 An antiproton (black sphere) trapped inside a helium atom is probed by two laser beams. According to modern cosmology, matter and antimatter were created in equal amounts in the Big Bang at the beginning of the universe. Physicists are developing concepts to explain why the visible universe now seems to be made entirely out of matter. On the other hand, experimental groups are producing antimatter atoms artificially to explore the fundamental symmetries between matter and antimatter, which according to the present theories of particle physics should have exactly the same properties, except for the opposite electrical charge). Now the independent research group Antimatter Spectroscopy of Dr. Masaki Hori, which is associated with the Laser Spectroscopy Division of Prof. Theodor W. Hänsch at the Max Planck Institute of Quantum Optics, has measured the mass of the antiproton relative to the electron with a precision of 1.3 parts per billion (Nature, 28 July 2011). For this they used a new method of laser spectroscopy on a half-antimatter, half-matter atom called antiprotonic helium. The result agreed with the proton mass measured to a similar level of precision, confirming the symmetry between matter and antimatter. The experiment was carried out at the European Laboratory for Particle Physics (CERN) in Geneva (Switzerland) in a project led by scientists from the Max Planck Institute of Quantum Optics and Tokyo University (Japan), and including the University of Brescia (Italy), the Stefan Meyer Institute (Vienna, Austria), and the KFKI Research Institute (Budapest, Hungary). Physicists believe that the laws of nature obey a fundamental symmetry called CPT (this stands for charge conjugation, parity, and time reversal), which postulates that if all the matter in the universe were replaced with antimatter, left and right inverted as if looking into a mirror, and the flow of time reversed, this anti-world would be indistinguishable from our real matter world. Antimatter atoms should weigh exactly the same as their matter counterparts. If scientists were to experimentally detect any deviation, however small, it would indicate that this fundamental symmetry is broken. Small is the keyword here  it is essential to use the most precise methods and instruments available to make this comparison with the highest possible precision. Antimatter is extraordinarily difficult to handle in the laboratory, because upon coming into contact with ordinary matter (even the air molecules in a room), it immediately annihilates, converting into energy and new particles. In 1997, researchers from the Max Planck Institute of Quantum Optics in cooperation with other European, Japanese, and American groups began construction of a facility called the Antiproton Decelerator (AD) at CERN. Here antiprotons produced in high-energy collisions are collected and stored in a vacuum pipe arranged in a 190-m-long racetrack shape. The antiprotons are gradually slowed down, before being transported to several experiments. The so-called ASACUSA1 (Atomic Spectroscopy and Collisions using Slow Antiprotons, named after a district in Tokyo) collaboration, of which Dr. Hori is one of the project leaders, sends the antiprotons into a helium target to create and study antiprotonic helium atoms. This time to go beyond this limit, a technique called two-photon laser spectroscopy was used. The atoms were struck by two laser beams travelling in opposite directions, with the result that the effect was partially cancelled, leading to a four to six times higher precision. The first laser caused the antiproton to make a quantum jump to a virtual energy level normally not allowed by quantum mechanics, so that the second laser could actually bring the antiproton up to the closest allowed state. Such a two-photon jump is normally difficult to achieve because the antiproton is heavy, but MPQ scientists accomplished it by building two ultra-sharp lasers and carefully choosing a special combination of laser frequencies. To do this, an optical frequency comb  a special device invented 10 years ago by the group of Prof. Theodor W. Hänsch to measure the frequency of light  was used. The Committee on Data for Science and Technology (CODATA) uses the results of this experiment as one of several input data to determine the proton-to-electron mass ratio, which in turn influences the values of many other fundamental constants. Im no physicist but is it possible that the expansion of the universe could be going so fast that the matter and antimatter particles can't annihilate? If so, then virtual particles won't have a chance to destroy each other. The universe fills with particles and collapses into a singularity. Congratulations to CERN for great accuracy in a very difficult measurement. And thank you to PhysOrg for top quality news. Im no physicist but is it possible that the expansion of the universe could be going so fast that the matter and antimatter particles can't annihilate? If so, then virtual particles won't have a chance to destroy each other. This would be akin to the end of the universe with a theory like the "big rip." IF (large emphasis on the IF) the "big rip" were to happen (it most likely will not), it would not be for a very very long time (tens of billions of years). The universe fills with particles and collapses into a singularity. I don't understand this statement (i.e. its nonsense). There was an article on physorg a while back that suggested that it is *possible* that matter and anti-matter would repel each other gravitationally. The article didn't say this is *true*, just said that at the levels that we manipulate a/m (one antiproton at a time), we can't measure it. Aaaaaaaaanyway, if they *do* repel, wouldn't matter and anti-matter naturally separate into "islands"? Kind of an oil-and-water situation. Some galaxies are matter, some are anti-matter. @Donutz: I remember that article. Consider that the Universe has had 14-odd billion years to achieve equilibrium, so that any interactions between the "edges" of your "islands" might simply not produce enough of an effect to detect from here. Still... it's a big Universe. You'd think that equilibrium would fail spectacularly SOMEWHERE! The paper you have mentioned predicts that as result of gravitational repulsion of matter and antimatter and the corresponding gravitational version of the Schwinger mechanism, a universe made from matter transforms into a universe made from antimatter (and vice versa); there is no room for their common existence. According to the paper, our universe is dominated by matter because the previous universe was dominated by antimatter. This conversion happens at a size of order of kilometres; hence there is no need for cosmological inflation in the primordial universe. Maybe they do both exist in separate galaxy clusters. Gamma ray burst maybe the result of the occasional intersection of matter and antimatter in significant quantities between them. The article said....matter .. replaced by anti-matter..and flow of time reversed..!?? Ya mean the anti-matter people would really..TAKE.. a crap when they went to the loo? Shudder to think what they would do with it then! You are wrong, There is no a single word about flow of time reversed. Regarding flow of time reversed, that is standard speculation with anti-matter. C is reversed. Why not T? Having a reversed arrow of time would probably be indistinguishable to us. A possibility is that the anti-matter universe mirrors ours but travelling backward from the big bang rather than forward. i.e. if you went back in time 27.2 billion years (assuming 13.6 is current age of universe) you would arrive at an anti-matter copy of yourself. I see, we were thinking about differant articles. Is it possible that anti-matter and matter were created in equal amounts but that they "spun" off in different directions so that one side of the Universe would be dominated by matter and the other by anti-matter? How accurately are positronium and anti-hydrogen spectra known? Do these confirm the same results for positron mass? We already know, that the positrons have the same mass, like the electrons and at the case of antiprotons the situation will be probably the same. Inside of atoms the inertia of particles is important, not their gravity. IMO it still doesn't say too much about asymmetry in mutual gravitational interactions of particles of antimatter and matter. The 'arrow of time' is much more than just a thermodynamic concept. Most fundamental is that it is known to be asymmetric and therefore is never observed to be reversible. What particle events do you know that have causes that follow effects? Actually, DM is correct as far as we know. In theory, it does not matter which sign time carries (see feynman diagrams). It is strictly an empirical observation for us that cause comes before effect; this is considered to be a result of entropy and the probability of some event spontaneously occuring(see brief history of time, hawkings). cause always comes before effect as a matter of reality. a violation has never been observed. time only has one direction of flow (sign) as a matter of observable fact. What particle events do you know that have causes that follow effects? Anywhere where you have an uncertainty principle at work the view of 'effect follows cause' becomes iffy. The more so the closer you limit the volume/time/impulse/energy you look at. Cause and effect seems to be an emergent (macroscopic) property - not a fundamental of the universe. @ap: Can you develop this further, or know somewhere that it is discussed you can reference. I like it. I have read some material on the arrow of time, but I think that this is a very relevant point in that discussion that I don't remember seeing phrased quite this way. Everywhere in quantum mechanics you already only have probability connections (correlations) between state a and state b - no direct cause and effect causation. that is why they use bra-ket notation. Schrödingers cat is probably the most widely known (thought) experiment. But interference experiments on singular electrons and the like also show that cause and effect aren't really that which is most fundamental. The presence of acausally created virtual particle pairs in a vaccuum (as evinced by the Casimir effect or - as yet to be dicovered - Hawking radiation) might also serve as an example. Sorry for typing stuff twice...It looked like the page ate my first post so I had to retype it from scratch. That isn't exactly the direction I was thinking of. These are all examples of uncertainty, but don't really get to the heart of the potential reverse time flow of anti-matter - causality issue. I'd argue that anti-matter having a reversed time arrow would be indistinguishable from our perspective. Causality would play a huge role in disputing this, but if causality is "emergent" then the answer to that argument is "Who cares?" With a reverse time arrow you'd like cause to follow effect, but maybe that is unnecessary if causality is emergent. I just listed them to show that causality is not all it's cracked up to be and that we shouldn't get too hooked on the concept - especially when discussing fundamental theories.